In this blog I will show you how you can call a webservice programmatically in Java without using a webservice library like JAX-WS or Apache Axis. Normally you would use of course a webservice library, but in some cases this can be useful and quick; for example when you have problems generating a client proxy with a webservice library or if you only need some small specific parts of the SOAP response XML tree. 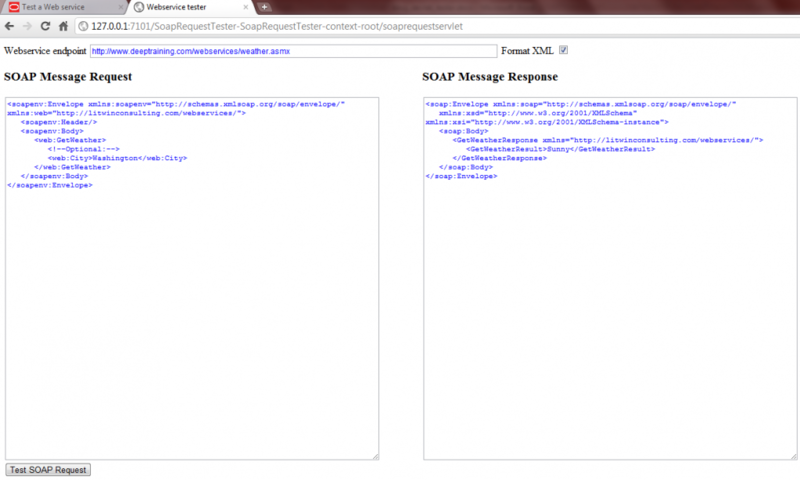 It shows that a SOAP call is just XML over HTTP, from a plain piece of Java code. 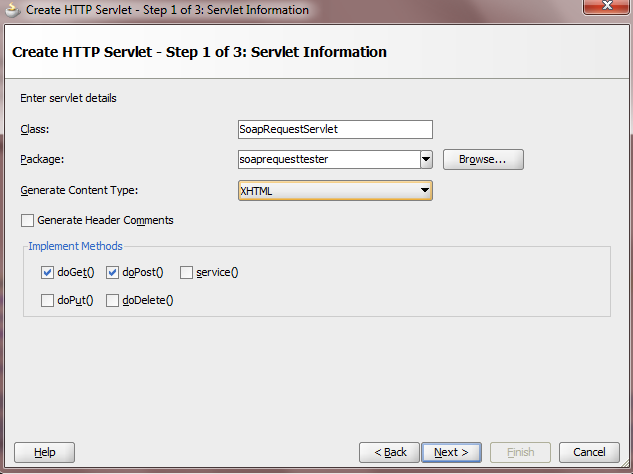 Then, I will show you an example how you can use this and make your own servlet webservice-tester like a simple SoapUI in JDeveloper 11.1.1.3. In this example I make use of a simple webservice: a weather webservice available on: http://www.deeptraining.com/webservices/weather.asmx?WSDL . 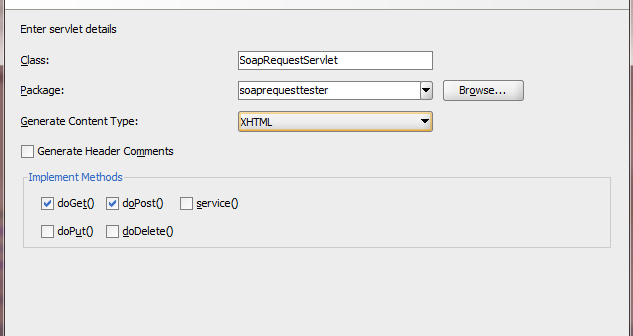 The following method is an example how to create a SOAP message request and call a remote webservice using a HttpURLConnection object, receive and process the SOAP message response. It returns the weather of a specific city. If you put this 3 methods together in a class with a main method, than you can simply call the weather webservice. Thats all! On our project we have a challenge where calling a webservice directly from Java is useful: because of very strict security reasons our client proxy application can access a remote webservice from only one single IP-address. This address is the machine where our production Weblogic server (WLS11g) is located and where we need to deploy our client application. This webservice is new and unfortunately it has many child-diseases: we often need to test, analyze and adjust the exact XML exchange of the SOAP-messages. 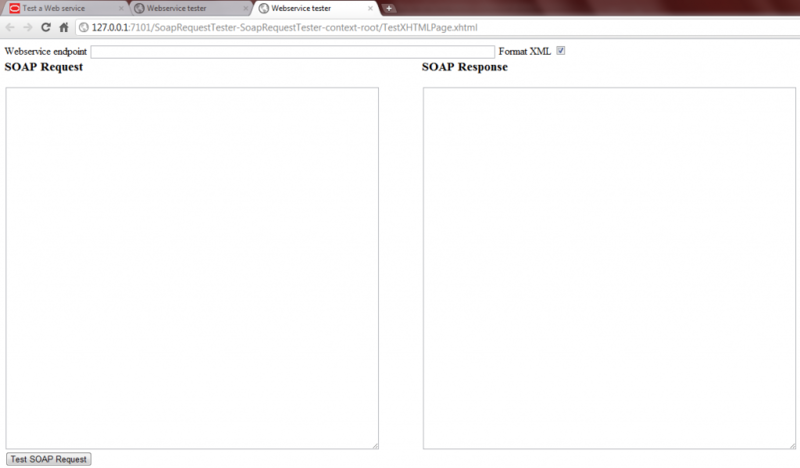 See also https://technology.amis.nl/blog/12004/how-to-remove-unwanted-soap-header-elements-in-jax-ws. Testing is very problematic if you dont have a webservice tester available. Every WLS normally contains a test webservice facility – like a simple SoapUI in the server. It should be standard available at http://host:port/wls_utc. In my JDevelopers locally embedded WLS I can directly find it but not use it – my IP-address is not authorized to get information from this webservice. Unfortunately on our production WLS we cannot reach its internal WLS webservice tester. I will show you how to create a servlet webservice tester. After deploying this tester on our production WLS, we were able to test and analyze the SOAP message exchange. create a new application and a new project. <input type="text" name="wsdl" size="120" id="wsdl"
<textarea style="font-size: 11px; color: blue;"
<input type="submit" name="Test SOAP Request"
//Whether to format the SOAP message response or not. // write the content of the request to the outputstream of the HTTP Connection. //Format the message when the checkbox is checked. //write the SOAP message response to the textarea. In the servlet, the doGet() method is called when you call the servlet for the first time. After clicking on the button to test the SOAP request, the doPost() method is called and the SOAP message request is send to the webservice endpoint . The SOAP message response is red and written in the second textarea. Your webservice tester is ready for real use ! Download this whole servlet project SoapRequestTester. But, if I've url address with .aspx extension,where are my methods,how I to create xmlInput? This is very close to something we are working on would it be possible to use something like this but add input boxs for the SOAP request for user testing? Hi Gulshan, thanks for your reply. But you are right, it was maybe a little confusing… I’ve adjusted it. Do you get aÂ SocketTimeoutException? You could try and catch (and handle) this exception . Thanks for the Excellent and detailed project shared with the global user community . I would like to mention a draw backs with the approachÂ . The above code hangs in scenarios where the Webservice provider is un responsive. To be more specific httpConn.getInputStream() function would make the thread to hang until the input stream is totally read. Let me know your thoughts on how this can be handled.